RPA are very proud to be TSI’s Gold Portacount Channel Partners and Portacount Training Providers for the UK. With over 20 years experience of practical Face Fit Testing, we provide TSI-approved training, technical support and fit test consultancy services for Portacount users throughout the UK. All of our trainers are Fit2Fit Accredited for both the TSI Portacount and Qualitative Fit Testing, and are experienced, dedicated experts in their field. Our TSI Portacount Fit Test Operator Training course is a Full Day course aimed at those who require an in-depth knowledge of Face Fit Testing using the TSI PortaCount. This course covers the Fit Test Operator criteria set out in HSE282/28 but also includes many additional practical elements including troubleshooting, how to plan and manage a fit test program and an advanced practical session. Our Respirator Face Fit Training courses are both theoretical and practical. 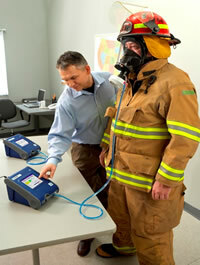 They aim to give candidates the skills and knowledge to meet the requirements of HSE282/28 for Fit Testing Operators.